Another big week . . .
First was early Monday morning at Fred Meyer. I had gotten home from a weekend away the night before and gone straight to the rental where I worked with DD#1 until after midnight! I was in bed by 1AM, but there was still no milk in the house so off the store I went early Monday. I had some register-printed coupons from Fred Meyer for Post Cereal so on top of the 3/$5 sale these boxes of cereal were only $1.17 each. Bacon was on sale for $2.99/lb. Milk was normal price of $5.39/gallon, eggs were on sale for $2.69/dozen. 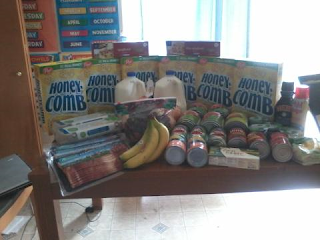 I also got cherries, bananas, & onion and a bottle of creamer I paid a whopping $2.79 for. It was the best option, but still way too much! Then I hit the jackpot in the clearance bins. I got 4 big cans of diced tomatoes for $0.69 each, 4 small cans of diced tomatoes for $0.49 each, 2 cans of corn for $0.29 each, tomato paste for $0.29 each, a big can of peaches for $0.99 to take camping, 2 boxes of spaghetti for $0.49 each, Pam for $1.89 (and I had a coupon for $0.30 off), clearance Greek yogurt for $0.69 each. Phew! I spent $61.75. Tuesday evening I drove out to Monroe to pick up blueberries at my favorite no-spray farm. They were charging $18 for an 8 pound flat. I got 3 flats for me and 11 flats for my girlfriends who wanted some. So my blueberries were $54. Later that night I popped into QFC hoping to get a deal on creamer, but realized it was a digital coupon. I don't have a smart phone so I just poked around the clearance bins. 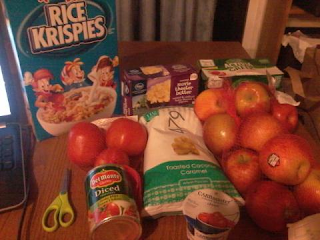 I found a couple bags of apples (with 5 and 6 apples in them!) for $1.00, 4 pack of Greek yogurt for $1.79, microwave popcorn for $0.99, Rice Krispies for $1.99 (big box), and some gluten-free caramel corn I thought the girls would like in our packed lunches. I spent $9.22. We've been working a lot in Issaquah on the rental, but I've been so busy I haven't been able to pop into Champion Foods - until this week! 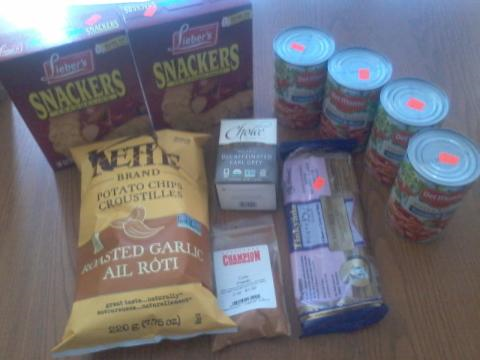 I found just a few things and spent $12.65 on crackers, pasta sauce, organic decaf tea for my preggo self, brown rice pasta, curry powder, and a couple bags of chips. Then yesterday I went down to QFC to get cream, bananas, and grapes and came home with all this! 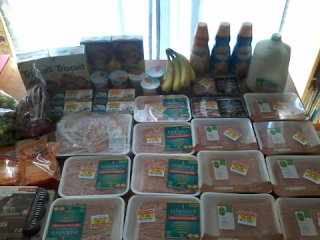 I got a package of boneless, skinless chicken breast for $1.79/lb, 6 - 1# packages of ground Isernio's chicken for $1.50 each (and I had a coupon for $1.00 off one of them), 7 -1# packages of organic ground turkey for just $0.99 each (! 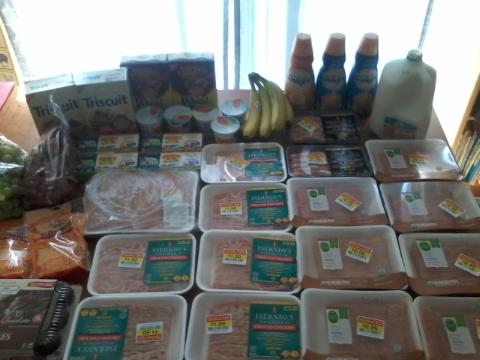 ), 2 packages of Isernio's breakfast sausages for $1.50 each (for camping), 2 - 8 oz bags of Tillamook shredded sharp cheddar that were on sale and I had a coupon making them $1.50 each, 3 creamers for $1.99 each, a dozen donuts (not pictured) for $3.99, ridiculously priced GF chocolate muffins for $4.99 so DD#2 could also have a treat, 6-packs of boxed dried cranberries for $0.99 each, 5 clearance yogurts for $0.29 each, organic milk on clearance for $2.49, after coupons the crackers were $1.25 each, and I also got red grapes, green grapes, and bananas. I spent $62.70. Once again I am making very poor progress on paying off my credit card which I've been floating a small balance on for over a year. So far I've managed to pay off 30% since March, when I confessed to DH that I'd been floating a balance (but never paying interest). Maybe I'll manage a bit more by the end of July.